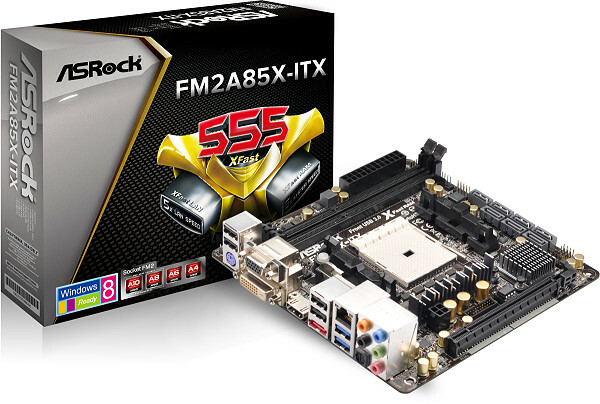 Two motherboards were just released by ASRock, and they both have the FM2 socket, which means that the idea is to use them as foundations for a PC with an AMD APU. Despite the fact that the latest CPU which is expected from AMD will not be an APU (it’s actually the FX-4130 CPU, a Quad Core model), ASRock decided to release two new platforms designed with APUs in mind, and not with CPUs. The two motherboards, FM2A85X and FM2A85X-ITX are designed with the APU’s known as Richland and Trinity, from the A-Series chips. The name probably gives it away, but the chipset that is used in the two motherboards is A85X. FM2A85X-ITX is the model designed as a mini-ITX and it has a 24 pins ATX, 6 phases VRM, power connectors for the CPU with 4 pins, two RAM slots which can take DDR3-1866 in dual channel, 7 SATA ports with a 6 Gbps capacity and a slot PCI Express 2 x16. If you choose to, you can set up HDD/SSD in RAID 0/1/10 on it. The company has also chose to implement a number of video outputs on it (including dual DVI, D-Sub and HDMI), as well as a eSATA port at 6.0 Gbps. The price at which this model will be sold is expected to be around the $110 mark. The second motherboard that was released by ASRock is FM2A85X Pro, which is considered full ATX. Despite the bigger size of the motherboard, the features are not as good on it, which is understandable since the price tag is smaller, at around $80. One of the lower priced components on it is the VRM in 5 phases, though there are other parts that keep the price small. One of the cost cutting decision they took with this model was the use of only two memory slots in dual channel configuration, set to accept DDR3-1866 modules. There is also only one slot for PCI Express 2 X16 and an additional x4 PCI Express 2 slot. On paper it doesn’t look like a great motherboard and its only saving grace is the existence of a legacy PCI slot plus three x1 PCI Express 2.0 connectors. If it didn’t have these features, it could’ve just as easily been a micro ATX motherboard. This motherboard also has 8 SATA connectors at 6.0 Gbps, audio with 6 channels, USB 2 and 3 connectors, PS/2 ports and Gigabit Ethernet.